Chase has also made the cash back rebate on purchases a bit more lucrative: You’ll now earn 5% cash back on the first $25,000 spent annually on office supplies, wireless, landline and cable services (including bundled TV, high speed internet and phone), 2% cash back on gas and dining up to $25,000 in spend every year and 1% cash back on everything else. The card also has an intro 0% APR on both purchases and balance transfers for the first 6 months, although balance transfers are assessed a hefty 5% fee, with a $15 min and no cap. There is, however, no annual fee. Another Ink business credit card offering a $250 bonus is the Ink Bold with Ultimate Rewards. The Ink Bold is a pay-in-full card with no interest expense and up to 30 days to pay. Under the Ink Bold offer, you’ll earn 25,000 bonus points after your first purchase (worth $250 in cash, or more if redeemed for travel). In addition, you can earn over 45,000 additional bonus points every year for meeting specified spending thresholds. For instance, once you spend at least $25,000, you’ll receive 7,500 bonus points. Upon reaching $50,000 in net purchases, you’ll earn another 15,000 bonus points. And finally, upon exceeding $100,000 in net purchases, you’ll receive an additional 25,000 bonus points. What this means is that if you spend exactly $100,000 in a year, your effective cash back would be 1.475%. 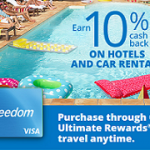 If redeemed for travel through Ultimate Rewards, your points will be worth 25% more. The annual fee of $95 is waived for the first year under this offer.